Image: Suriyo Hmun Kaew/EyeEm/Getty Images, pixelliebe/Getty Images. Design: Ashley Britton/SheKnows. During high school, I spent most evenings holed up in my bedroom, chatting away with friends for hours on the telephone. And no, we're not talking about a cell phone — this was a landline. With a cord. That plugged into the wall. But then, the internet came, giving us the gift of email and instant messaging, which allowed us to hold multiple conversations with different friends at once without the hassle of, you know, actually talking. Texting came next, and before we knew it, replaced phone calls as our primary method of getting in touch with someone instantly. More: Can Workplace Anxiety Be a Good Thing? Gradually, phone calls became reserved for getting in touch with your parents, fielding calls from telemarketers or hearing from friends or family members during emergencies. They went from being the default mode of communication to something reserved for potentially urgent situations. Somewhere along the line, a lot of people (especially those who grew up always having internet access) developed a specific type of anxiety around talking on the phone. Sure, part of it could be that phone calls may mean something bad happened, but it goes beyond that: We got so out of the habit of speaking on the phone that the act itself made us anxious. To get a better understanding of this phone-phobia, we spoke with several mental health professionals who shed light on why this happens. To start with, a phone call always comes with some element of surprise and uncertainty, which many may find unsettling. "For people that struggle with anxiety, situations that are less predictable or planned can result in an increase in symptoms," psychologist Dr. Kelly Moore tells SheKnows. "So if you have to hold conversations with people directly, the unpredictable factor definitely goes up as you move from a text or email interaction, to an actual phone or in-person… conversation." She also says it depends on who you're speaking with on the phone. She finds that "anxiety creeps in more if we are less familiar with the person we are talking to on the phone." This could mean that we talk more than usual or aren't our authentic selves on the phone, she adds. For me, this is when my professional telephone voice kicks in. After years of working at law firms and newspapers in the days before email was the default mode of communication, I found myself on the phone constantly throughout the day and without realizing it would automatically switch into using my professional telephone voice with people I didn't know. Sure, part of it was trying to sound professional, but there was definitely an element of anxiety involved too. "A person may feel anxious about making a mistake, misunderstanding something without the help of seeing social cues or making a social blunder, like talking over a person or interrupting by mistake," she explains. And of course, some of the anxiety stems from the fact that we're just not used to talking on the phone as much as we were in the past. "Communication today, particularly for younger individuals, is much less direct than in the past," Dr. Kate Jansen, a psychologist and assistant professor at Midwestern University, tells SheKnows. "Dating is initiated through… apps, where potential mates are screened before communication begins and then is primarily text-based until the face-to-face meeting. Business communication is conducted via email, parties are planned via group texts or social media. These communication methods all provide a barrier between parties, the speaker can edit their message before sending, receiver can choose the time to review and respond to the message." Not only that, but today, we can do almost anything without having the hassle of talking to another human — whether that's ordering food online, instant messaging our coworkers, scheduling medical appointments or renewing library books. 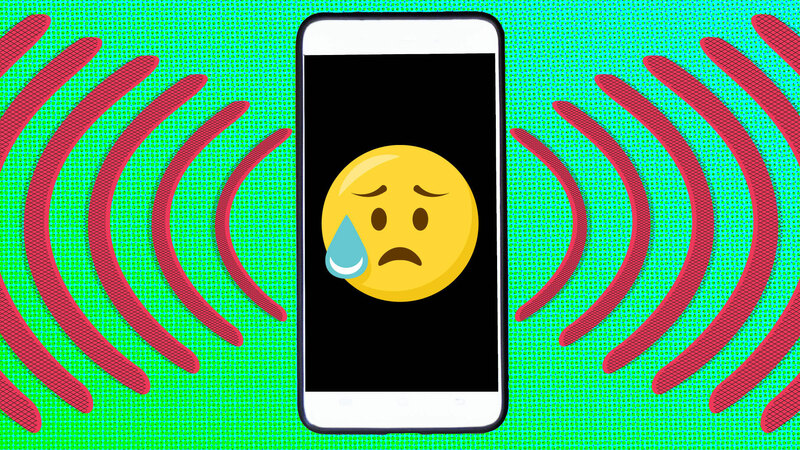 "By removing the necessity of talking on the phone, we never face the fear or overcome the vulnerability that comes with it," Jansen explains. "In a way, this snowballs: the more we avoid the thing that is causing fear, the more fearful we become." With any type of anxiety — phone-related or not — Kelly Moore says that the first step is becoming aware of what is making you nervous or fearful. Once you've recognized that phone calls give you anxiety, she stresses that it's important not to avoid otherwise safe situations (like talking on the phone) simply because they give you anxiety. "Giving into avoidance can result in missed opportunities for you, such as that new job or new relationship," she explains. "Rather, try to build in as much predictability as you can to allay your anxiety." In addition, Kelly Moore says being prepared for a phone call may help with the anxiety. This could include jotting down some talking points and notes before the call, taking deep breaths before answering the phone, and if it helps, setting time limit for how long you'd like the call to last and politely letting the other person know how much time you have to talk. "This way, you are both opening yourself up while also setting boundaries to manage your anxiety," she adds. And though it sounds counterintuitive, Kathryn Moore suggests the way to getting over phone anxiety is to talk on the phone more. "Practice will improve a person’s skills and they will feel less anxious as they become more used to talking on a phone," she says. Similarly, Jansen recommends picking up the phone more to get over your anxiety, starting small, calling a friend or family member rather than texting, then moving up to ordering a pizza or making an appointment. "Over time with enough small exposures, the fear will likely subside," she says. So there you have it — do the opposite of what my parents told me to do throughout my teenage years: Get on the phone!